The price is $8,500.00 firm. 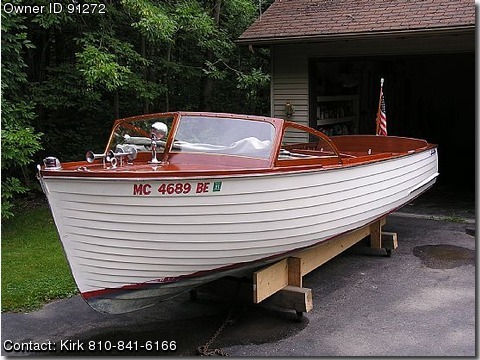 I've owned the boat since 1988 and at that time the boat was stripped down to bare wood and refinished and partial new upholstery and chrome. The engine ran strong and sound. The boat has been stored indoors for the last 19 years. The engine was fogged and the fuel was drained. Work that could be done includes: some cushions need new zippers sewn in, gauges need repair, bright work could be refinished and paint freshened up. The canvas is in very good shape except the side curtains need new glass and the chrome needs polish. As far as rot, engine condition, ribs, stringers, transom and uneven woodwork – there are no problems in any of these areas. I do not have a trailer for the boat. On a scale of 1 – 10, the boat could be a 8 or 9 with very little effort. As far as I know, the boat has never been damaged.